Radioactive material was detected in a monitoring well in April at an Exelon-owned nuclear power plant in Pennsylvania about 40 miles from Baltimore, according to nuclear regulators. Exelon, the parent company of Baltimore Gas and Electric Co. and the largest owner of nuclear power plants in the United States, notified the U.S. Nuclear Regulatory Commission that it found dangerous levels of tritium, a radioactive isotope of hydrogen, in a monitoring well at Peach Bottom Atomic Power Station on the Susquehanna River in Delta, Pa. The agency said the contamination posed no danger. "I would say there's no cause for concern for people who work at the plant or members of the public," said Neil Sheehan, a spokesman for the NRC. "It's not used by members of the public. We're talking about low levels" of contamination. Exelon found tritium at 37,700 picocuries per liter, higher than the 20,000 picocuries per liter drinking water limit set by the U.S. Environmental Protection Agency Sheehan said regulators will examine ways to mitigate the contamination in a forthcoming inspection. It may be a concern in the future if the tritium ends up leaching into the Susquehanna, he said. Krista M. Connelly, a spokeswoman for the Peach Bottom power plant, said the plant has been monitoring the issue closely. "The affected groundwater is monitored, has not affected drinking water or the river, and results of more recent tests have shown tritium levels have returned to previous values," she said. "The groundwater stations or wells are specifically designed to allow for early detection and prompt mitigation." An advocacy group, Beyond Nuclear, criticized the NRC for its oversight of the leak, saying regulators have been monitoring and mitigating such leaks in a lax manner. The issue was highlighted in a report issued Thursday by the group called "Leak First, Fix Later: Uncontrolled and Unmonitored Radioactive Releases from Nuclear Power Plants." stock here: These are horrible numbers. 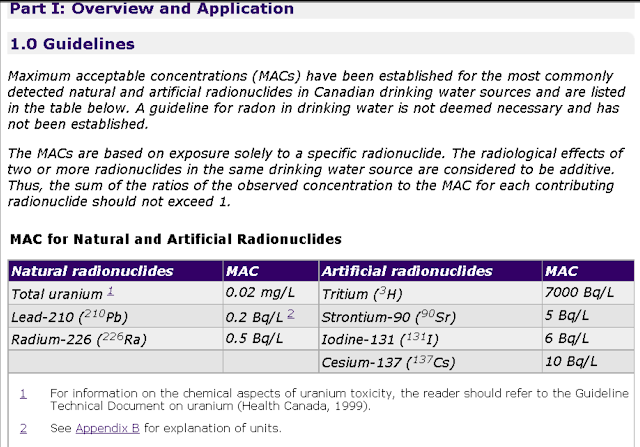 Tritium allowed in drinking water is 1200 times higher than strontium. 2 reasons. First tritium doesn't bioaccumulate, so that is used as an excuse, however, should you receive a steady supply of tritium, it is just as dangerous! Second, they have no way to filter or treat for tritium water, so they allow lots of it. Who knows what a pico-Curie is off the top of their head in terms of danger? Usually just the old school radiation cartel people. So this use this to throw people off, because most of the post Fukushima crowd knows mSv. Or Bq/L or Bq/M3. 1,369,000 Bq/M3 is what they found. But its no risk, at this time, trust us, we made the bad numbers go away before and we can do it again. Exelon the slumlord of nuclear.